You will be able to explain the significance of the To Error is Human Report, and identify its highlights. You will be able to list and discuss key steps that can be taken in preventing medical errors. You will be able to discuss the scope of the problem of medical errors and discuss it has become a leading cause of death and injury. You will be able to identify some of the reasons why errors happen, and discuss what can be done to minimize their occurrence. 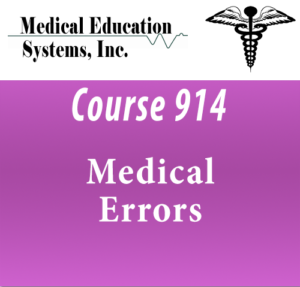 You will be able to discuss what types of errors can occur and where they tend to occur.